Soundartist Hans van Koolwijk (NL 1952) is designer-builder and composer-performer of various soundsculptures. He works with sound as a sculptor works with stone or clay. 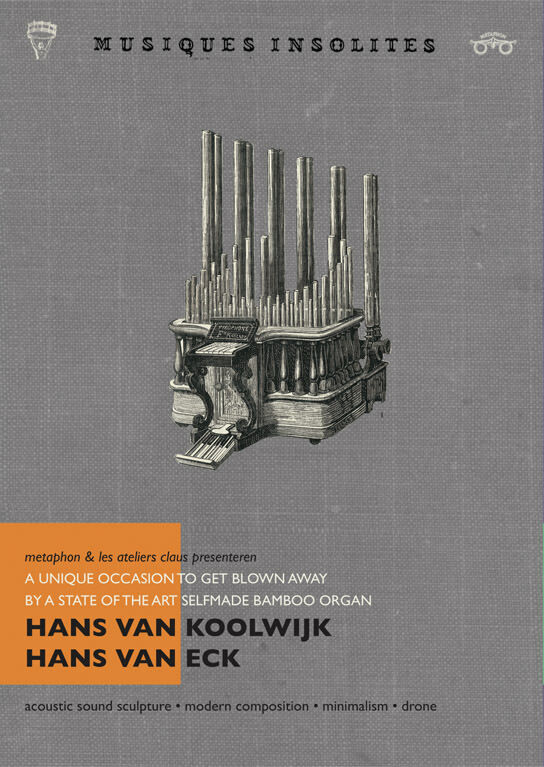 His central work is the ‘Bambuso Sonoro’, an unpolished bamboo organ that impressively connects the visual and auditive aspect. His starting point ‘sound is matter’ has been applied all over his sound sculptures (Eg. De Oersprong, de Oerkaatser, de Klankkaatser, Glissandomachines). Some of his works are site specific, others can be shown at regular locations. Over the last 25 years he created a wide pallet ranging from simple sound sculptures to very complex machines which he continues to elaborate. Van Koolwijk performed all over Europe with his instruments and did various projects with music ensembles, ao. Merlijn Twaalfhoven, Noise-Maker’s Fifes and mostly with Hans van Eck with whom he has been collaborating since 15 years. On this afternoon of ‘Musiques Insolites’ Hans van Koolwijk & Hans van Eck will demonstrate how refined and musical soundsculptures can be. Hans van Eck is a Dutch soundartist-composer and musicologist. He studied ao. with G.M. Koenig, Jaap Vink and Ton de Leeuw. Since 1976 he composes electronic and instrumental music. Van Eck is also one of the founders of the Schrek Ensemble that besides own compositions perform works by ao. Giacinto Scelsi, Luigi Nono, Helmut Lachenmann, John Cage… The last 15 years van Eck wrote specific compositions for the sound sculptures of Hans van Koolwijk and contributed to the development of these music machines.